Cisco Small Business Switches are ideal entry-level network connection devices suited for small businesses, remote offices, and branches seeking simple manageable solutions with a low cost to buy, helping them get the most value out of their networking purchase! 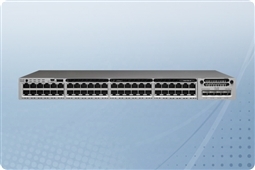 Cisco Catalyst Switches are the most scalable and versatile switching solution out of the Cisco portfolio of products! These powerful Cisco switches come in all port sizes and features sets including features such as Layer 3 Routing, Power Over Ethernet, SFP Ports and Uplinks, Stacking, and so much more! Aventis Systems is proud to offer our Cisco Catalyst switches and Small Business Switches all with a 1 Year Standard Comprehensive Warranty with upgrades available to Express Parts Next Business Day Replacement or Extended Term Warranties as well as Onsite Hardware Support Agreements. Shop our Cisco Catalyst and Small Business Switches below and get best in class connectivity, cost, and reliability for your business network today!